Product prices and availability are accurate as of 2019-04-05 15:39:47 EDT and are subject to change. Any price and availability information displayed on http://www.amazon.com/ at the time of purchase will apply to the purchase of this product. You need tools to help you control cash flow and manage employees for your expanding business. Sage Peachtree Pro Accounting with Payroll 2012 provides easy-to-use accounting features that do the basics and more, along with tools to run your payroll in-house for one full year. Automatically calculate deductions, earnings, and taxes, print paychecks from your PC, and manage benefits. Automate invoices and checks, track sales and inventory, create budgets, and more with standard accounting tools. Plus, with 80+ customizable reports, Sage Peachtree Pro Accounting with Payroll provides the accuracy and control you want for the results you need. 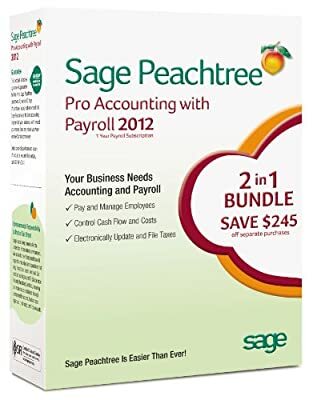 If you are the owner of a service- or product-oriented small business who needs to keep up with your expanding business and prefers the control and flexibility of managing your payroll in-house, then Sage Peachtree Pro Accounting with Payroll 2012 is for you. You’ll get the tools you need to help keep your payroll on time and accurate for one full year, plus an easy-to-use accounting solution that uses real, double-entry accounting principles to help you get your numbers right.